Made a few changes to A Pinch of Yum’s recipe to make it simple & with cleaner ingredients! Enjoy this comfort meal without the guilt! Preheat the oven to 400 degrees & generously grease a 9×13 baking dish. Bring the chicken broth & 1/2 cup milk to a low boil in a saucepan. Whisk the other 1/2 cup milk with the seasoning and flour; add the mixture to the boiling liquid and whisk until a smooth creamy sauce forms. In a large bowl, mix the sauce from step one & cooked quinoa and stir to combine. Add water for desired texture. Pour the mixture into the prepared baking dish. 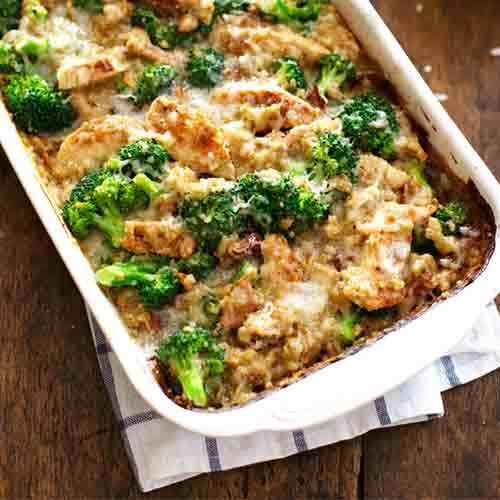 Shred chicken breasts into thin strips and lay the chicken breasts strips over the top of the quinoa mixture. Top with broccoli and cheddar. Bake in the oven until cheese is melted & you have desired consistency of sauce. Enjoy!